We are pleased to announce that the Journal of Pattern Recognition Research (JPRR) has been selected for coverage in Thomson Reuters products and services. Beginning with content published in 2015, this publication will be indexed and abstracted in Emerging Sources Citation Index (ESCI). 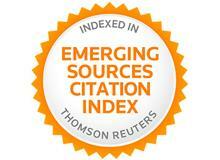 JPRR's content in ESCI is under consideration by Thomson Reuters for inclusion in products such as the Science Citation Index Expanded™ (SCIE), the Social Sciences Citation Index® (SSCI), and the Arts & Humanities Citation Index® (AHCI). Read the journal's most cited open-access articles online! Submit your next article to JPRR!